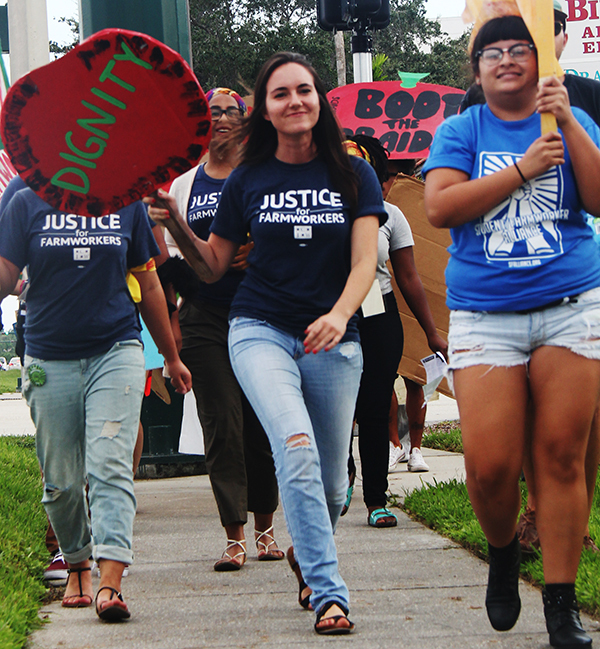 This past weekend, after months of planning and preparation, the Student / Farmworker Alliance hosted the 11th annual Encuentro in Immokalee, where students and young people from around the country gathered for a weekend to lay out a year’s worth plans for the Campaign for Fair Food. Of course, being members of the Fair Food Nation, the weekend’s participants also worked in a bit of action amidst all the conversation! 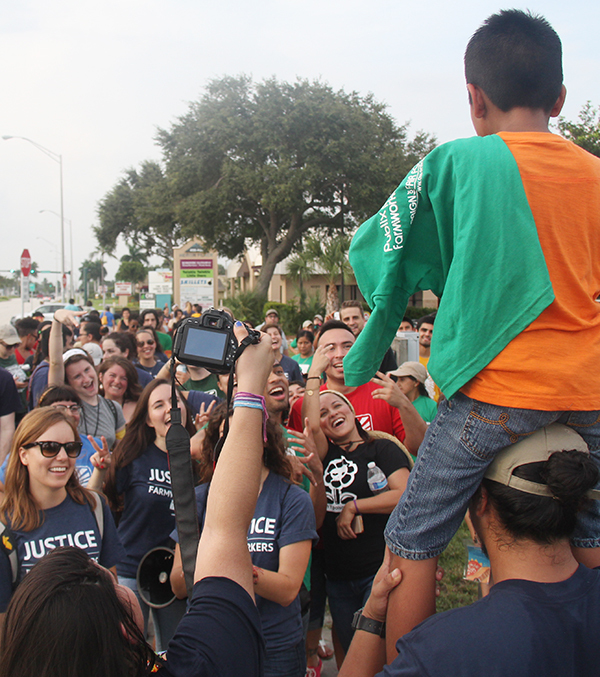 Energized from two days of workshops, strategic planning, and learning about the Fair Food Program and the road ahead for the CIW, the scores of Encuentro participants visiting Immokalee were ready to hit the streets by late Saturday afternoon for a dual Publix-Wendy’s protest in Naples. 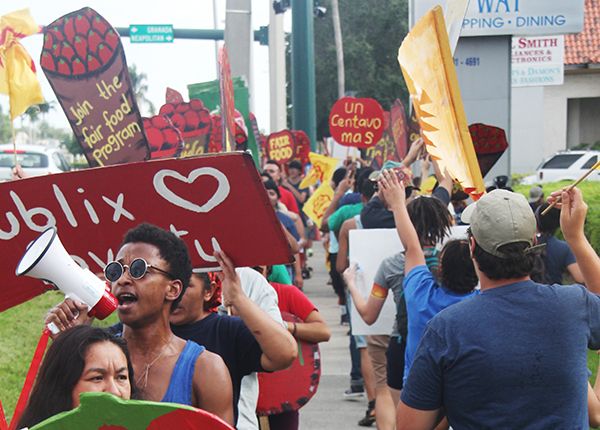 Today, we wanted to share a report from the inspiring weekend protest — which, to be sure, was only a taste of the season ahead for Publix, Wendy’s, Kroger and any other major food retailer still turning it back on the Fair Food Program. 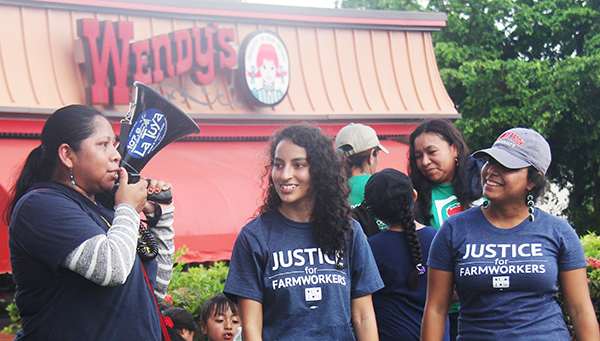 Chanting and cheering, the 100+ farmworkers and young people arrived at Wendy’s, the company with the doubly-dubious distinction of being the only major fast food chain still outside of the Fair Food Program and, since this past spring, the target of a student-led national boycott. This season, students will keep up the pressure on Wendy’s, and not allow the company to blind them. 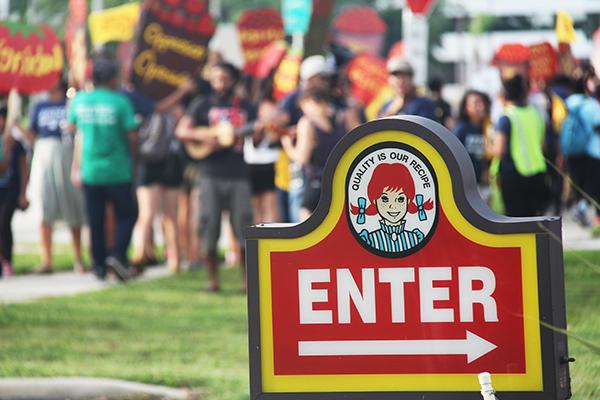 Maybe Wendy’s will continue to refuse to be a part of the Program today, but every day, there are more and more of us, and someday, Wendy’s will sign. 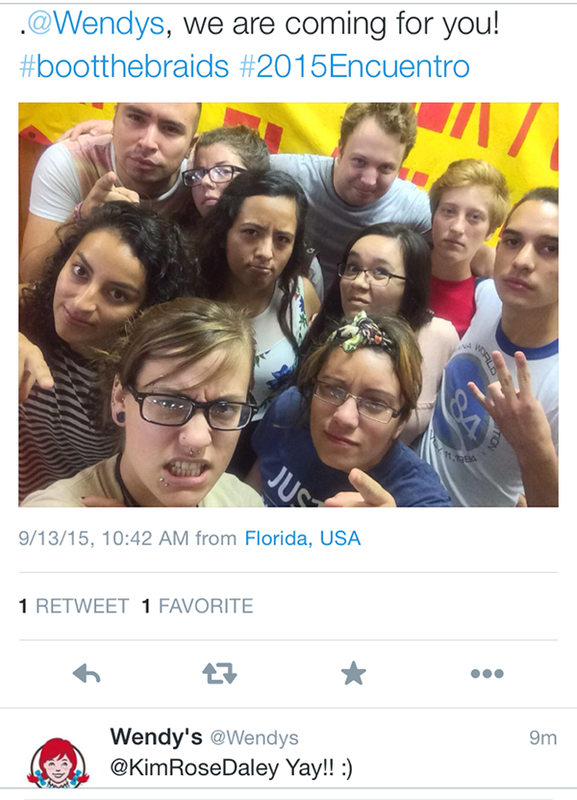 We are a stone in Wendy’s shoe — and we’re going to be there until they sign — so that they no longer trample our rights! I told the Publix manager that as a student at Barry University and as a Floridian, I would like to see Publix join the Fair Food Program. 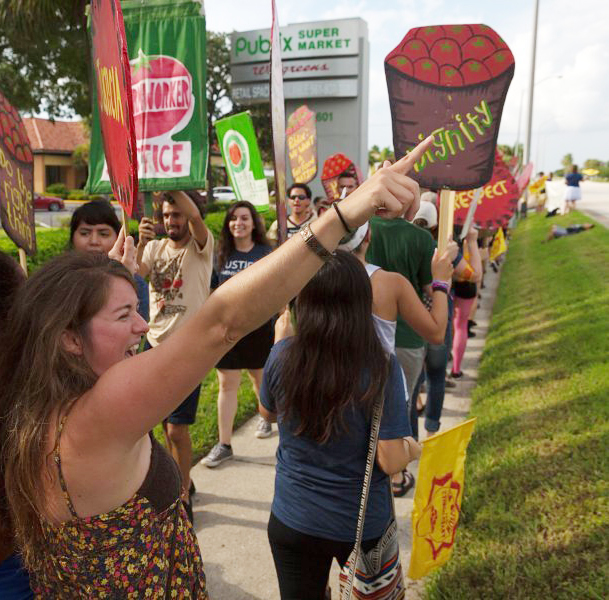 Until then, students will be supportive of the CIW until Publix sits down with them and signs an agreement. […] 14 major retailers are participating FFP, including Burger King, McDonalds and Subway. All together, the chains have paid $16 million in penny-per-pound payments to increase income for Florida tomato pickers. 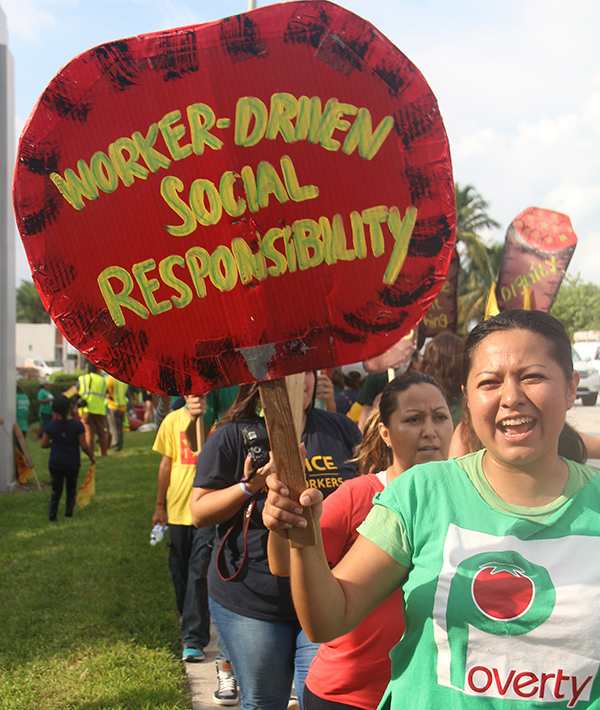 CIW is calling on Publix and Wendy’s to do the same. 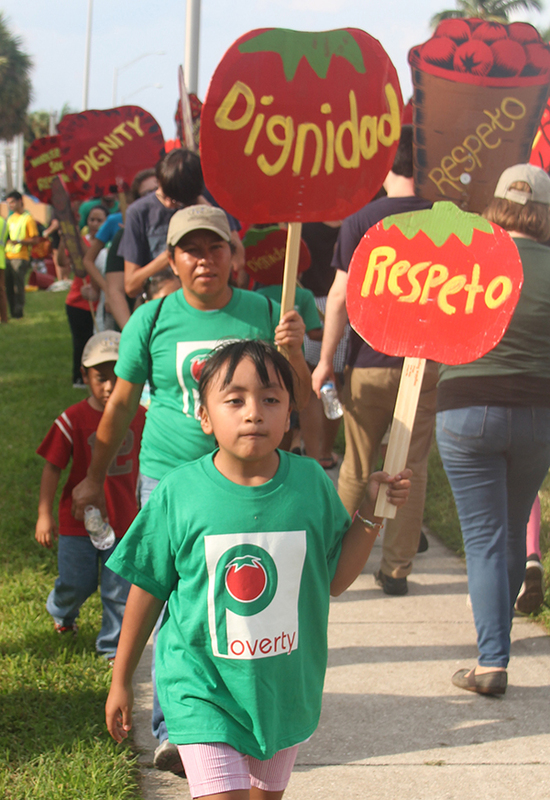 “We talk about the penny — it’s a little bit, but for the workers it means a lot,” said CIW member Santiago Perez. 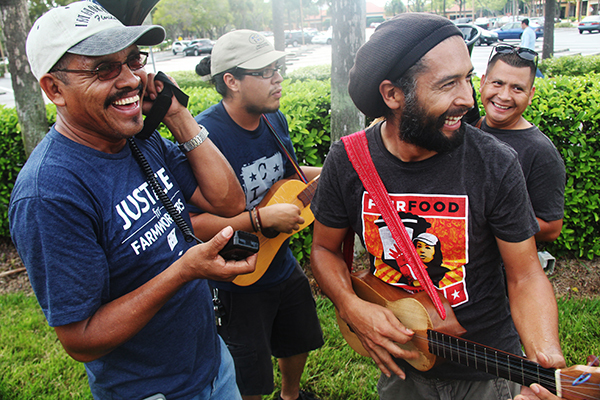 CIW workers delivered a letter to the store manager of the Publix on Neopolitan Way and Tamiami Trail in Naples Saturday. The letter urged Publix to join FFP, a request the Lakeland based grocer has resisted for several years. “It’s bogus, its ridiculous, it’s their duty to get involved with the products they sell,” countered [student ally Carlos] Salamanca. As we’ve seen time and time again, those pallid arguments offered by major corporate retailers cannot withstand consumer scrutiny for long in the 21st century. In the face of the sweeping success and expansion of the Fair Food Program, and the growing consumer and worker demand for Worker-driven Social Responsibility everywhere from factories in Bangladesh to dairy farms in Vermont, major retailers’ excuses and rationales for avoiding responsibility evaporate, sooner or later, under the heat of the spotlight. 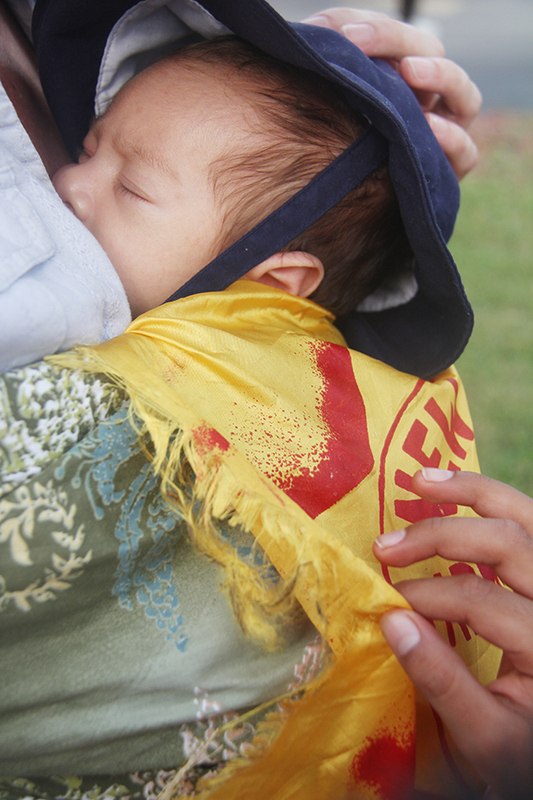 If the past weekend was any indication, this generation of spirited, committed young people will surely continue to stand alongside all workers in demanding real, systemic change in global supply chains.